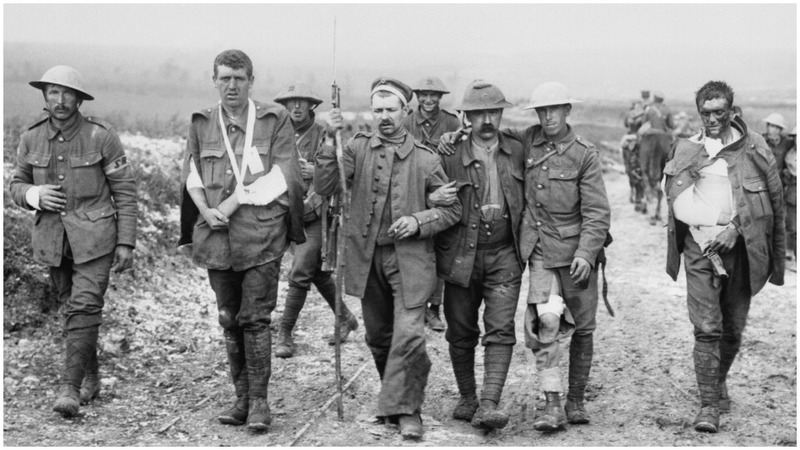 November 11, 2018 marks the centenary of the end of World War I. During that bloody slaughter, the propagandists described it as the “war to end all wars.” One hundred years and as many wars on, leaders of the nations of Europe and the U.S., many of them the authors and overseers of the present conflicts from Afghanistan to Yemen, are meeting in Paris to promote the so-called “Great War” as something noble. There is nothing honourable about such carnage. It is therefore appropriate to re-publish below a short story, “The Discarded Soldier,” by the world-famous novelist and short story writer Liam O’Flaherty (1896-1984), which presents the real and barbaric nature of war. Liam knew what he was writing about. He not only fought in the trenches of Flanders as a member of the British Army’s Irish Guards, but was wounded and shell-shocked in September 1917. His abhorrence of war is expressed poignantly in this text and his avant-garde 1929 novel Return of the Brute. 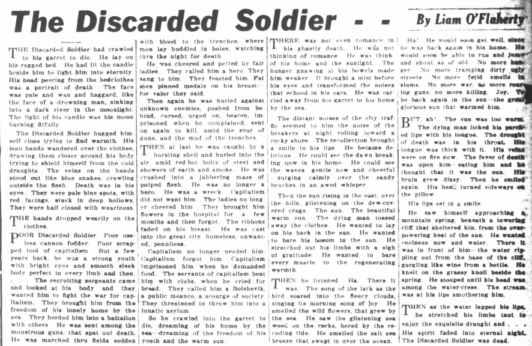 What is also interesting about “The Discarded Soldier” is that it was published for the first—and probably only—time in The Daily Worker, predecessor of People’s World, on June 27, 1925. A columnist of the paper had requested this internationally renowned Irish author to pen the piece. Liam could hardly refuse, as The Daily Worker’s columnist was none other than his brother, Tom O’Flaherty. The brothers came from the Irish-speaking Aran Islands off the west coast of Ireland. Both were writers and both were involved in the communist movement. 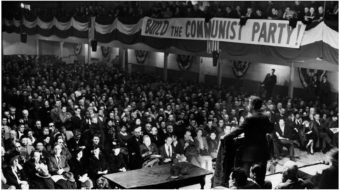 Both were founding members of two separate Communist Parties: Tom of the Communist Party USA and Liam of the Communist Party in Ireland. “The Discarded Soldier” was never collected and is virtually unknown. We have Seosamh Ó Cuaig to thank for rediscovering this story. He is the chairperson of the Liam and Tom O’Flaherty Society in Ireland that was founded in 2013. It was while researching Tom O’Flaherty that he came across “The Discarded Soldier.” Interestingly, Seosamh, like Liam and Tom, is a native Irish speaker and hails from Connemara on the coast of Galway Bay, at the mouth of which lie the Aran Islands, the O’Flahertys’ birthplace. We share in the great pride and pleasure that People’s World, the successor to The Daily Worker, today republishes this story from its early days. For an evocative reading of the story by Fionnghuala Ní Choncheanainn, filmed by Eoin McDonnell in an atmospheric Aran setting, at our annual O’Flaherty festival on Inis Mór in 2014, click here. Editor’s note: People’s World gratefully acknowledges Dr. Jenny Farrell, Seosamh Ó Cuaig, and the Liam and Tom O’Flaherty Society for rescuing this historic short story from our archives. We proudly reprint it as a tribute to all the soldiers discarded from capitalism’s wars over the past 100 years since the end of “the war to end all wars.” Special thanks to Dr. Farrell for the introduction above. THE Discarded Soldier had crawled to his garret to die. He lay on his ragged bed. He had lit the candle beside him to light him into eternity. His head peering from the bedclothes was a portrait of death. The face was pale and wan and haggard, like the face of a drowning man, sinking into a dark river in the moonlight. The light of his candle was his moon burning fitfully. The Discarded Soldier hugged himself close trying to find warmth. His lean hands wandered over the clothes, drawing them closer around his body trying to shield himself from the cold draughts. The veins on the hands stood out like blue snakes, crawling outside the flesh. Death was in his eyes. They were pale blue spots, with red facings, stuck in deep hollows. They were half closed with weariness. THE hands dropped wearily on the clothes. POOR Discarded Soldier. Poor useless cannon fodder. Poor scrapped tool of capitalism. But a few years back, he was a strong youth with bright eyes and smooth sleek body perfect in every limb and then … The recruiting sergeants came and looked at his body and they wanted him to fight the war for capitalism. They brought him from the freedom of his lonely home by the sea. They herded him into a battalion with others. He was sent among the monstrous guns, that spat out death. He was marched through fields sodden with blood to the trenches, where men lay huddled in holes, watching through the night for death. He was cheered and petted by fair ladies. They called him a hero. 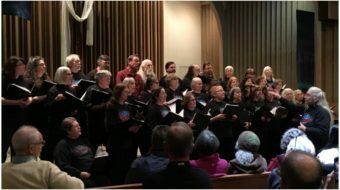 They sang to him. They feasted him. Fat men pinned medals on his breast—for valour they said. Then again he was hurled against unknown enemies, pushed from behind, cursed, urged on, beaten, imprisoned when he complained, sent on again to kill, amid the roar of guns, and the mud of the trenches. THEN at last he was caught by a bursting shell and hurled into the air, amid red-hot bolts of steel and showers of earth and smoke. He was crushed into a jabbering mass of pulped flesh. He was no longer a hero. He was a wreck. Capitalism did not want him. The ladies no longer cheered him. They brought him flowers in the hospital for a few months and then forgot. The ribbons faded on his breast. He was cast into the great city, homeless, unwanted, penniless. Capitalism no longer needed him. Capitalism forgot him. Capitalism imprisoned him when he demanded food. 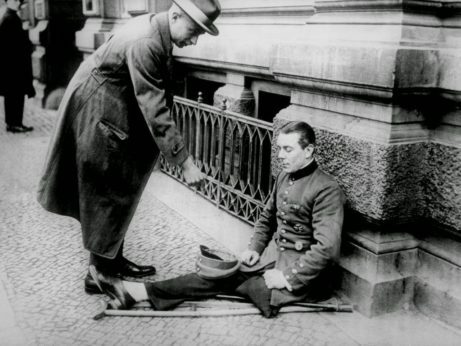 The servants of capitalism beat him with clubs, when he cried for bread. 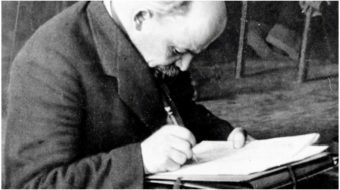 They called him a Bolshevik, a public menace, a scourge of society. They threatened to throw him into a lunatic asylum. So he crawled into the garret to die, dreaming of his home by the sea—dreaming of the freedom of his youth and the warm sun. THERE was not even romance in his ghastly death. He was not thinking of romance. He was thinking of his home and the sunlight. The hunger gnawing at his bowels made him weaker. It brought a mist before his eyes and transformed the noises that echoed in his ears. He was carried away from his garret to his home by the sea. The distant noises of the city traffic seemed to him the noise of the breakers at night rolling toward a rocky shore. The recollection brought a smile to his lips. He became delirious. He could see the dawn breaking now in his home. He could see the waves—gentle now and cheerful—surging calmly over the sandy beaches in an awed whisper. Then the sun rising in the east, over the hills, glistening on the dew-covered crags. The sun. The beautiful warm sun. The dying man tossed away the clothes. He wanted to bare his bosom to the sun. He stretched out his limbs with a sigh of gratitude. He wanted to bare every muscle to the regenerating warmth. THEN he listened. Ha. There it was. The song of the lark as the bird soared into the fleecy clouds, singing its morning song of joy. He smelled the wild flowers, that grew by the sea. He saw the glistening sea weed on the rocks, bared by the receding tide. He smelled the salt sea breeze that swept over the ocean. Ha! He would soon get well, since he was back again in his home. He would soon be able to run and jump and shout as of old. No more hunger. No more tramping dirty, ugly streets. No more fetid smells in the slums. No more war, no more roaring guns, no more killing. Joy. To be back again in the sun—the great glorious sun that warmed him. BUT, ah! The sun was too warm. The dying man licked his parched lips with his tongue. The drought of death was in his throat. His tongue was thick with it. His veins were on fire now. The fever of death was upon him—eating him and he thought that it was the sun. His brain grew dizzy. Then he smiled again. His head turned sideways on the pillow. His lips set in a smile. He saw himself approaching a mountain spring, beneath a towering cliff that sheltered him from the overpowering heat of the sun. He wanted coolness now and water. There it was in front of him—the water rippling out from the base of the cliff, gurgling like wine from a bottle. He knelt on the grassy knoll beside the spring. He stooped until his head was among the water-cress. The stream was at his lips smothering him. THEN as the water lapped his lips, he stretched his limbs taut to enjoy the exquisite draught and … His spirit faded into the eternal night. The Discarded Soldier was dead. 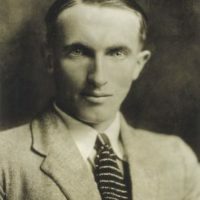 Liam O'Flaherty (1896-1984) was an Irish novelist and short story writer and a major figure in the Irish literary renaissance. He served in World War I as a member of the Irish Guards in the British Army and was later a founding member of the Communist Party of Ireland. 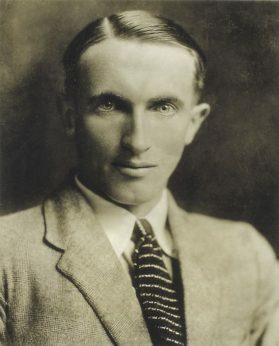 He sometimes wrote for the Daily Worker, a predecessor of People's World, in the early 1920s.